Hyderabad: Andhra Pradesh Chief Minister and Telugu Desam supremo N. Chandrababu Naidu on Monday took his fight for Special Category Status directly to the doorstep of Prime Minister Narendra Modi as his day-long fast in New Delhi turned into another show of unity by the prominent opposition leaders. As Naidu launched a fresh round of assault on the BJP government at the centre, especially the Prime Minister who alleged that he “betrayed” the people of the state, several opposition leaders headed by Congress president Rahul Gandhi and former Prime Minister Manmohan Singh joined him at the hunger strike camp at the Andhra Pradesh Bhavan to express their solidarity. Sporting a black shirt as a mark of protest, an angry Chandrababu Naidu used harsh language, terming Modi a “liar” and “cheater”. He demanded that the prime minister announce Special Category Status for the state during the current session of Parliament. The issue was the main bone of contention between the truncated state of Andhra Pradesh and the centre after Telangana was carved out. The status would make the state eligible for many tax incentives and special funds in the face of a severe resources crunch. Following the refusal by the Modi regime to award the state the status, Naidu’s Telugu Desam Party severed relations with the BJP and walked out of the Modi-led coalition government in March last. Recalling that it had been BJP leaders who had demanded the status for Andhra Pradesh on the floor of the house, on account of the state having suffered on account of bifurcation, Chandrababu Naidu said that when a state is discriminated against, it is his responsibility to fight and raise the voice of the people. “A grave injustice was done to the state by not fulfilling a single promise made to the state,” he said. Listing out the grievances, he said that centre did not provide funds for the Polavaram project or for the construction of new capital Amarvati, adding that demands for a steel plant in Kadapa and Visakhapatnam Railway Zone had been shot down. “They have also not compensated the revenue deficit of the new born state,” he added. Before taking up the fast, Naidu was accompanied by senior leaders and TDP members of parliament as he visited Raj Ghat, the resting place of father of the nation Mahatma Gandhi and paid tributes. The fast came a day after Prime Minister Modi’s personal attacks on Chandrababu at a public meeting in Guntur on Sunday fuelled the ongoing fight between the two. Monday’s hunger strike was, however, marred by a tragic incident when an individual from Andhra Pradesh committed suicide in protest against the centre’s refusal to award the state Special Category Status. According to Delhi police, D. Arjun, a resident of Srikakulam district, was found dead on the footpath of Jaswanth Singh Road this morning. A letter believed to be written by Arjun, stated that he had chosen to end his life over the centre’s refusal to award the state with the Special Category Status. On hearing about the incident Chandrababu Naidu and other participants in the hunger strike observed a minute’s silence to pay respect to him. Rahul Gandhi, who was among the first to visit the camp, told the gathering that on coming to power the Congress party will fulfil all promises made to Andhra Pradesh at the time of the state’s bifurcation. “Isn’t Andhra Pradesh a part of the country?” he asked, lashing out at Modi for forgetting his promises and lying to hide his failures. “The prime minister does not have any credibility. He utters only lies,” Rahul Gandhi said. 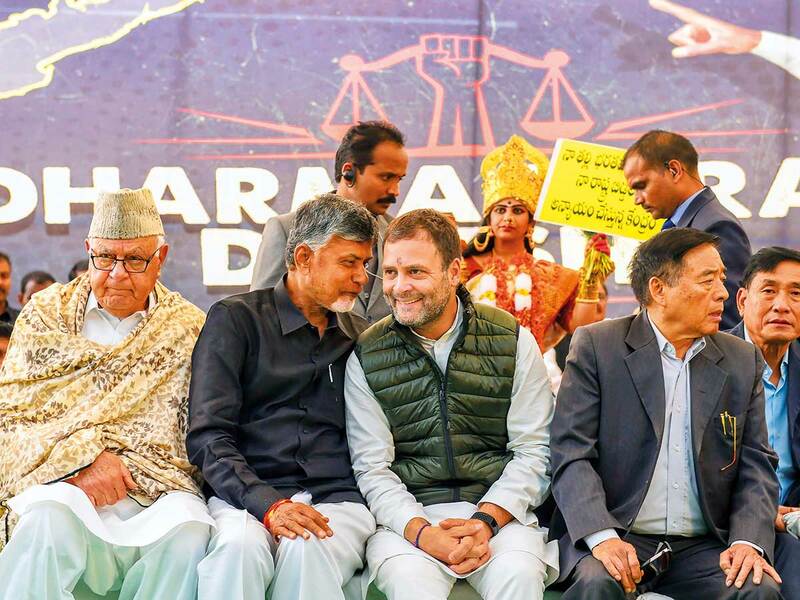 Other leaders who visited the venue of Naidu’s ‘Dharma Poratam’ include Delhi Chief Minister Arvind Kejriwal, former Uttar Pradesh Chief Minister Mulayam Singh Yadav, former Jammu and Kashmir Chief Minister Farooq Abdullah, senior leader Sharad Yadav and Trinamool Congress leader Derek O’Brien. Former Prime Minister Mamohan Singh, during whose reign the government assured Andhra Pradesh in Parliament of all the help including Special Category Status, declared his support to Naidu’s struggle. “All the parties had approved the promises made to Andhra Pradesh at the time of bifurcation. Fulfilling these promises is the responsibility of the government”, Sindh said. Farooq Abdullah alleged that the Central government was following the policy of divide and rule on caste and communal lines. “Because of injustice the people of Andhra Pradesh were forced to come here”, he said. Kejriwal recalled that during the 2014 election campaign, Modi had promised Special Category Status to Andhra Pradesh before the Lord Venkateshwara Swamy in Tirupati. “Modi is a habitual liar,” he said before declaring the Aam Admi Party was supporting Naidu.